Conceptual Physics: How a GM tube operates? The counter is named as GM counter based on its developers ‘Geiger’ and ‘Muller’ in 1928. They are oldest type of gas filled radiation detectors.GM counters were operated in the Geiger discharge region of gas filled ion chambers. Construction: - The counter is usually a leak tight assembly of two electrodes electrically isolated. The counter is filled to sub atmospheric pressures of few mm of mercury. 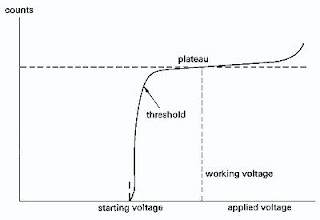 A high voltage is applied to the anode electrode. Principle: - This counter also works on the principle of ionization caused by incoming energetic particle in the gas medium filled between anode and cathode. The electron liberated in the primary ionization event would get accelerated towards anode because of its high potential. The electron may gain sufficient energy to cause ionization of other gas molecule. This leads to a chain of ionizing events which is usually referred to as Townsend avalanche. During this process, there may be interactions in which excitation of atoms may occur due to sufficient energy of impinging electrons. Such atoms while de-exciting may emit photons which normally fall in UV or visible region. These photons which are emitted may again lead to photo electrons due to ionization of gas atoms or due to photoelectric interaction with walls of counter. Each photo electron would again cause Townsend effect. Such a series of Townsend avalanches would lead to discharge in the tube called Geiger-discharge. In such a state there is formation of dense envelope of electron-ion pairs distributed on either side of anode. 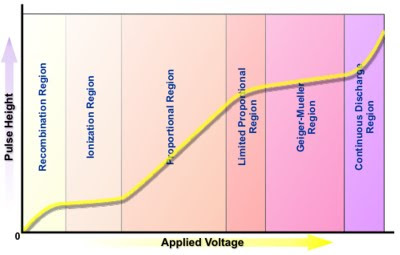 The voltage applied to anode shall be such that it is enough to trigger the avalanche mechanism and collect total charge (electrons) pertaining to single event leading to Geiger discharge. Concept of quenching: - Practically the process would not be as simple as above. During the Geiger discharge, there is dense envelope of electrons and ions. The electrons would drift towards anode and positive ions would drift towards cathode. The positive ions which drift towards cathode having ionization potential (E) greater than the work function (W) of cathode material leads to exchange of electron from cathode and becomes neutral. The excess energy may be dissipated in two forms, one by emission of photon or an electron form cathode if excess energy is greater than the work function of the cathode material. This would again initiate another Geiger discharge. The result of this is that the tube would always be in continuous Geiger discharge and hence will not able to measure any radiation. This involves addition of small quantity of organic gas having complex molecule structure. This prevents the continuous Geiger discharge mechanism by charge transfer collision principle. The positive ions on their path collide with organic molecules to get neutralized. This makes only ions of organic gas reach cathode and gets neutralized. If there is any excess energy released leads to dissociation of organic molecules. Thus multiple Geiger discharges could be avoided. A typical filling of organic quenched GM tubes is 90% Argon and 10% of ethyl alcohol. When organic gas gets depleted to a sufficient extent there is occurrence of multiple discharges frequently and thus the plateau length gets decreased, with slope increased. Thus the organic quenched GM tubes are characterized by short life time and thus not suitable for operation in very high fields which leads to large count rate. To overcome this, technique of Halogen quenching is introduced. Halogen quenching: - This involves the addition of small quantity of Halogen gas such as Chlorine or Bromine. A typical filling is about 0.1% of chlorine to Neon. The quenching action is same as that in Organic quenching process. The diatomic halogen gas molecules too gets dissociated in quenching but gets recombined to replenish the gas molecules and thus counter life gets extended. i) Dead time: - As discussed above, the positive ions take considerable time to reach cathode tube compared to electrons. The reason is that the mobility of electrons is about 1000 times greater than that of electrons. Due to the low drift velocity of positive ions, there is formation of cloud of positive ions which tend to electric field opposite to that of actual field. This reduces the electric field intensity due to anode potential and thus affects gas multiplication factor. This in turn affects the pulse heights. In high count rates, it is more worse that there is formation of dense positive cloud which makes the electric field intensity in the vicinity of anode wire reduce by great margin thus multiplication goes down by big margin. During this phase of detector, any new ionizing event caused by incoming particle cannot be recorded. Thus the time interval during which any event caused by newly incoming particle would not get counted and called as dead time of the country. ii) Recovery time: - After certain time, all the positive ions tend to reach cathode wall and thus the electric field begins to restore to actual value. When the electric field goes beyond a critical value there is again formation for pulses. But the process requires some time to give maximum pulse heights. Hence the total time required for GM tube to give maximum pulse height pulses is Recovery time. iii) Plateau length & Slope: In order to decide the operating voltage of the GM tube, a graph between anode voltage (X axis) and count rate (Y axis) is plotted. After applying minimum voltage to initiate Geiger discharge, the no. of pulses shall remain same in fixed radiation field exposure. But due to formation of short pulses during recovery time there is variation in count rate. Thus one of the quality parameters deciding the operation of GM tube is that plateau slope shall be less. Usually 2-3% plateau slope is a good choice. As we go on applying voltage to the anode, the tube starts entering continuous discharge region. Thus the slope gets worsened. 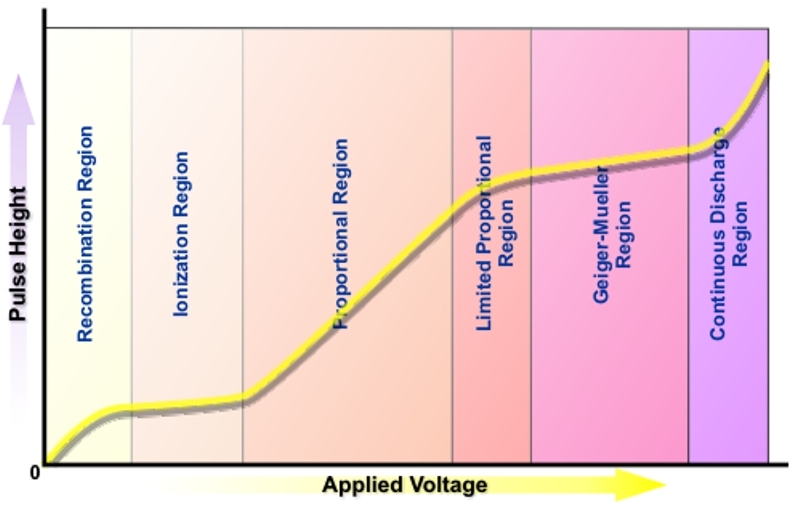 The region or length of voltage region during which the plateau slope remains in desired value is called as plateau length and usually the operating voltage is chosen at the midpoint of plateau length. You can download complete details of these counters here.